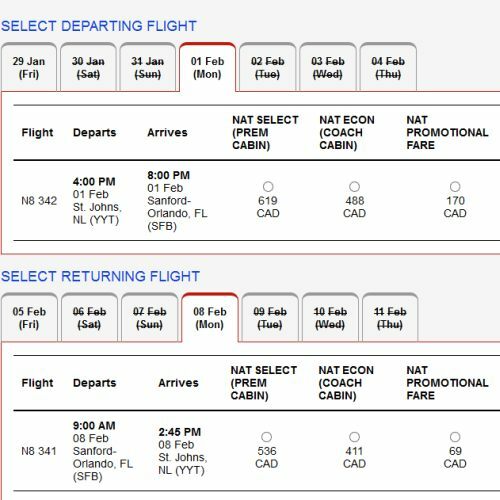 Yes, there are some more cheap flights from Newfoundland to Orlando, Florida - this time on National Airlines, for a roundtrip price of $238 CAD roundtrip including taxes. National Airlines is a charter airline based in Orlando, Florida. Note that National Airlines uses Orlando's Sanford Airport (SFB). Most airlines use Orlando International Airport (MCO). For comparison, SFB airport is about a 50 min drive to Walt Disney World. The more commonly used MCO airport is 20 min. The 'Disney Magical Express' (for those staying at Disney properties) does not operate from SFB. Late January and early February 2016. Update: National Airlines has dropped the majority of their flights down to $298 CAD roundtrip including taxes, on dates all the way up to May 2016. 2. Change the currency from $USD to $CAD. Note that with the National Airlines website, when you search for 2 passengers, it's showing you the total price for both people. So if you search for 2 passengers and see $339 for the flight there, and $138 for the flight back, that's the total price for 2 people, which works out to $238/person for each roundtrip flight. st johns, yyt, united states, flight deals, newfoundland, orlando, florida, north america, disney world, national airlines, sfb and sanford. One Response to "Last minute: Newfoundland to Orlando, Florida - $238 CAD roundtrip including taxes"
I don't think this deal is available anymore. Can't seem to find it on any dates.